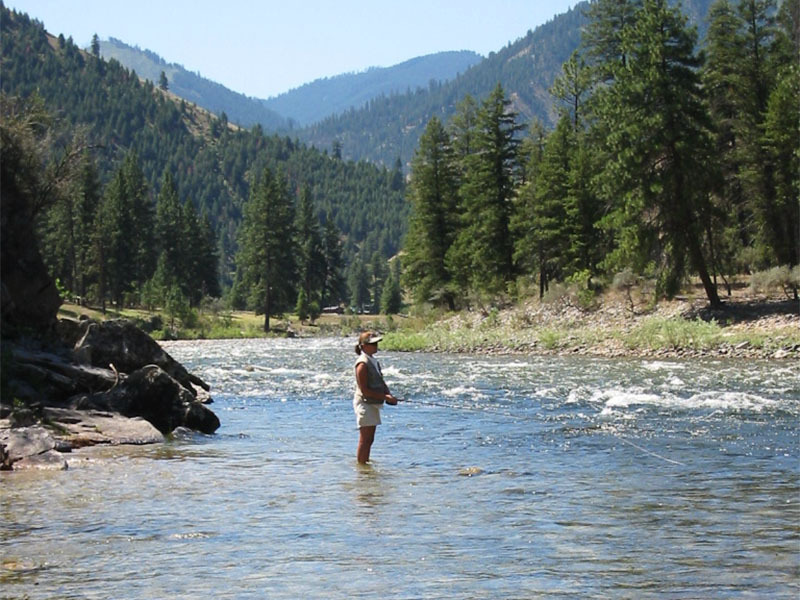 Experience incredible fishing on the world famous Salmon River. Situated in a remote wilderness location, yet with all the comforts of home, Shepp Ranch makes a perfect base station for steelhead and trout fishing. In the summer, fly-fishing trips on the Salmon River and the surrounding tributaries are one of our more popular guest ranch activities. Guests can experience the best of Idaho’s fly fishing opportunities right from the comfort of the Ranch. For added adventure, horse pack, hiking, or jetboat excursions open up new opportunities to fish in a variety of nearby streams and lakes. During the summer, we offer great small stream fly-fishing. Crooked Creek runs right through the Ranch, offering miles of water to explore right from your cabin door. 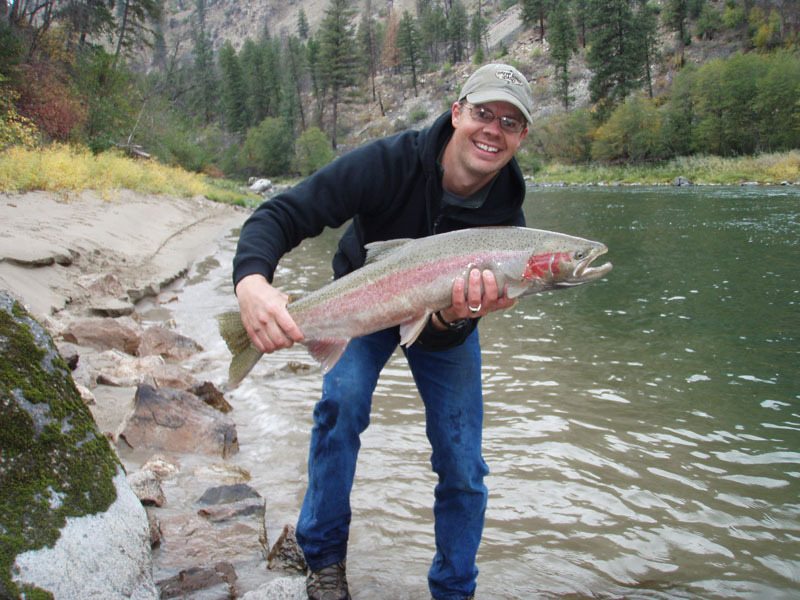 Most fish caught are small Steelhead smolts (rainbows), along with some larger Cutthroat trout. There are also several other streams to fish within a short jetboat ride from the ranch. These streams are very productive, and while the fish are not huge, the plentiful action makes for super fishing. With the nearest road 15 miles away, Shepp Ranch is truly a remote wilderness lodge. Access is provided either by jetboat or by light aircraft. We have comfortable cabins on the banks of the Salmon River with accommodations for up to 16 guests. All meals are prepared fresh, and served family style in our dining room. After a day of fishing, you can relax in our lodge, or enjoy some peace and quiet soaking in the hot tub overlooking the river. There is nothing quite like hooking into a 30″ Steelhead while fishing in the beautiful Salmon River Canyon. During spring and fall, we have some of the best Steelhead fishing in all of Idaho. Our experienced guides know the river’s nooks and crannies and when the fish are moving. Our jetboats allow us to cover long stretches of the river every day from our base at the Ranch. During early spring and late fall we fish for Steelhead on the Salmon River using two jetboats. Depending on the time of year, we use spin or casting rods to drift bait or pull plugs. Fishing from the boats is productive and provides a great opportunity to visit with friends as you fish in a spectacular wilderness setting. We are also able to accommodate fly fishing from either the boats or from great locations on the banks of the Salmon River. The Salmon River Canyon is the second deepest gorge in North America. The rugged, rocky canyon walls provide dramatic scenery as you spend your days on the river. During spring, wildlife is abundant in the canyon. It is common to see elk, deer, bighorn sheep, and occasionally a black bear while you fish. 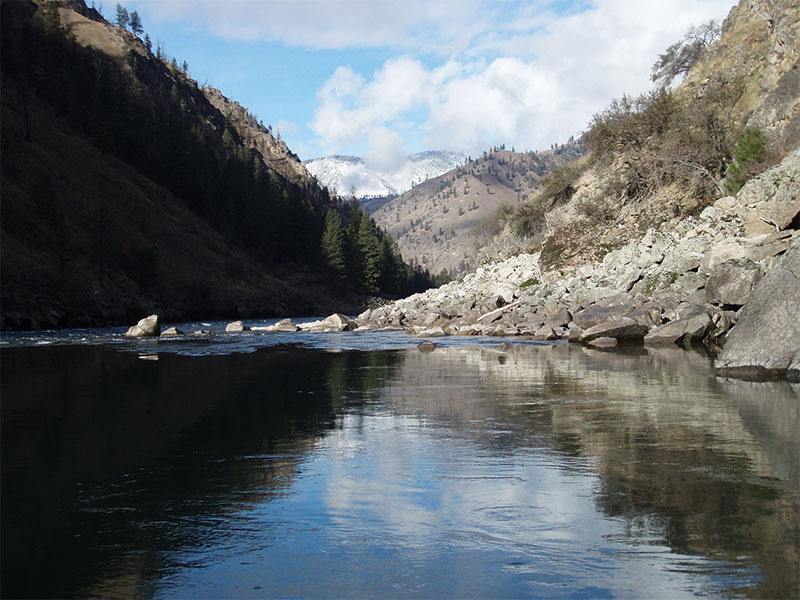 Few places offer Steelhead fishing in such a beautiful, remote setting.